Defend the Constitution. Defend principles. Be honest about politicians. I’ve never been a huge fan of Ann Coulter. While politically I am aligned with many of her perspectives, she struck me as more sensational for the sake of being a sensation than as a person truly interested in helping to solve America’s problems. 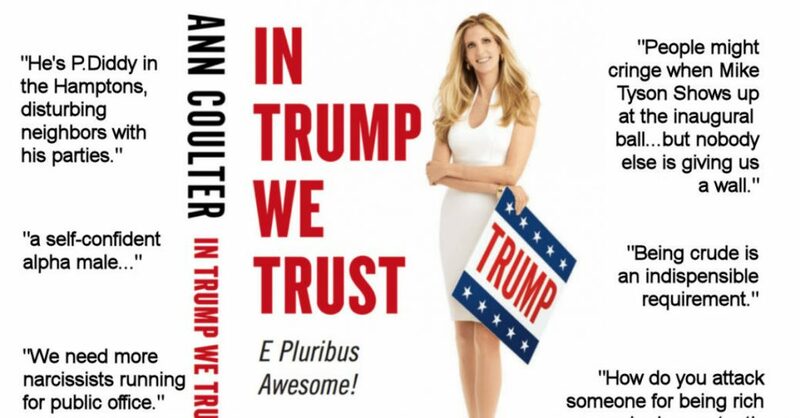 When she did a 180 on many GOP Presidential candidates she once supported to be an early adopter of Donald Trump’s campaign, I realized my suspicions were correct. She embraces perceived boldness over solid policy. This is why I was pleasantly surprised when she started calling out Trump recently. When a public figure puts so much political capital into someone, they are inclined to continue even when things turn south. The budget deal hit her hard and she lashed out against Trump. With all the hoopla surrounding the way the President may or may not have handled James Comey, Michael Flynn, Israeli intelligence with the Russians, and even potential tapes made of conversations, we’re seeing many people both public and private doing backflips to spin it as conspiracy theory or standard MSM manipulation. Here’s the thing: there are conspiracy theories out there that are crazy and the mainstream media is going to manipulate things against the GOP. That doesn’t justify taking attention away from clear missteps and poor decisions by the administration. Nobody should be a willful puppet for anyone else, particularly a politician. For full disclosure, I’m a founding member of the Federalist Party. I’m no longer the GOP-apologist that I may have been earlier in life. On the other hand, I’m not one who will attack from every angle just because it behooves me to do so for my party. I’ll call it like I see it. When the administration does well, I’ll cheer. When they do poorly, I’ll dissent. That’s just how I work. I would strongly encourage other conservatives to operate in the same fashion. The left is going to exploit every situation to their advantage. It may be considered prudent for us to follow the same gameplan, but we’re supposed to be better than that. We have a higher road we can take. We defend the Constitution and we stand by our principles. Those are two things that should be strongly embedded in everyone who believes in a small-government, conservative, federalist philosophy. President Trump is an icon to millions of Americans. Every president is and Trump adds a certain flair that encourages loyalty. Let’s not allow that loyalty to cloud our judgment. If we give the Constitution and conservative principles the primacy they deserve in our political perspectives, no politicians should be above reproach when they go off course. Call it like it is. Leave the spin to the left. It’s really their only tool.